To celebrate Motiv's 10 year anniversary they are releasing a a limited edition solid black T10 bowling ball. The Motiv T10 LE is a nod to the first ball that they released 10 years ago. This ball features Motiv's first core, the Thrust, and a retro NeoMark graphic. These classic features are paired with new coverstock technology. The core in this ball has a relatively high RG and differential which creates a smooth yet powerful backend motion. The Coercion Medium Friction Solid (MFS) Reactive coverstock is finished with 3000 grit LSS and is ideal for medium oil. This cover and finish help create moderate length with a strong and controllable down lane motion. This ball is a benchmark ball and a good match for the average bowler as well as the competitive bowler looking to expand their arsenal with a unique reaction shape. Overview: In celebration of the 10th Anniversary of Motiv comes the release of the limited edition T-10, featuring the high RG/high differential Thrust core (2.54/0.052 @ 15lbs.) wrapped in Coercion MFS (Medium Friction Solid) Reactive coverstock. Review: A true benchmark piece for Motiv, with its strong core and stronger cover, the T10 is like a combination of the Forza SS and Rogue Blade. Stronger cover will get the ball reading the lane sooner, the higher RG will help retain energy so the ball will go through the pins better. At box finish, it was little cleaner than I expected, so I like to keep mine with more surface (1000-2000) to fit in my arsenal. T10 will be 2-3 ft cleaner and 2-3 boards less overall hook. The biggest difference I see is when the lanes start breaking down, the T10 will retain energy better, which will allow me to keep it in my hands longer. 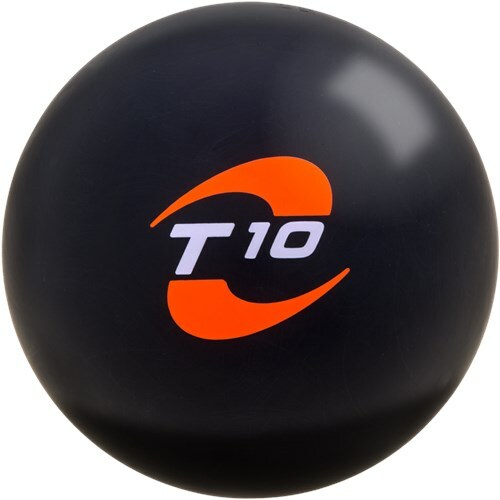 Final Thoughts: With its classic look, the T10 is that benchmark piece that will fit in a variety of bowlers’ bags. It fits nicely in between the Forza SS and Rogue Blade, in the sense of shape and amount of hook. T10 will be the first ball out of the bag on medium lane conditions. The THRUST core with the Coercion MFS cover gives me a smooth very controllable back end with a strong finish through the pins. This ball is perfect for any style bowler that wants a smooth backend without losing drive into the pocket. A MUST HAVE IN YOUR BAG!!! Page created in 0.666 seconds with 22 queries.